Select a finish Gallifrey Emblem Dalek DW Logo Tardis Police Sign Wibbly Wobbly Tardis Plain Stipple Back Tardis (Match Front) Make it STAR WARS! Select a fabric Black Broadcloth Denim Unbleached Canvas Unbleached Muslin Specify a Color! For the Dr. Who fan in your life! This bag is fully customizable! This gorgeous padded shoulder-strapped and quilted purse is perfect for stashing your favorite treasures, journals, jewelry, crystals, tarot cards, dice, gaming supplies, cosmetics and more. Fashionably chic, this extra sturdy quilted and padded shoulder-strapped zipper bag is constructed from stonewashed blue denim. The bag itself measures 8.5" across and is 12" tall. There is a zipper under the flap, it has a blue satin ribbon zipper pull on it. There is one divider inside, so there are two compartments inside the purse. 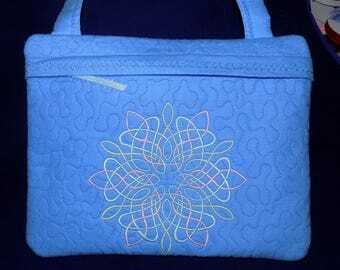 The bag is fully stipple quilted to give it some body without a lot of bulk. The front has extra padding to provide a layer of protection for electronics and other valuables. 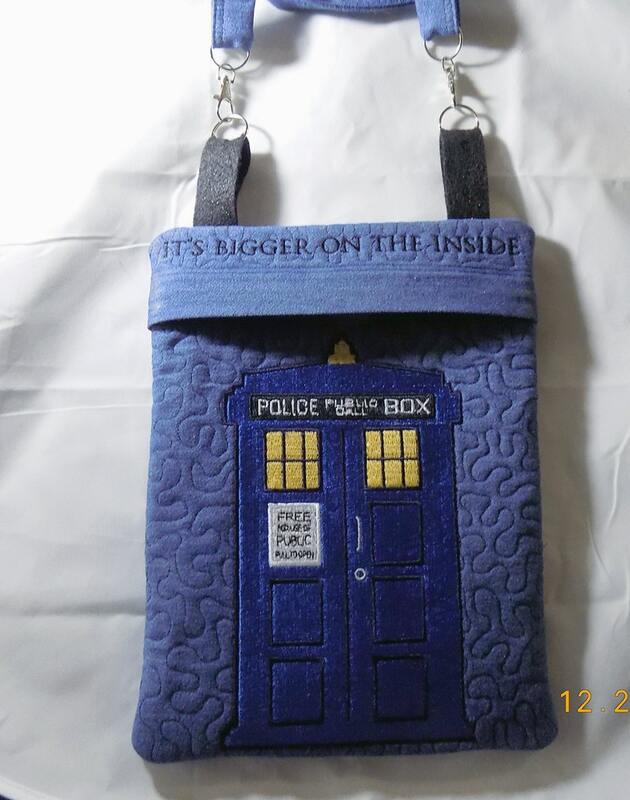 The front of the purse features an embroidered Tardis design with a quote from Dr. Who across the zipper flap. Zipper flap is also trimmed with black cotton piping. Counting both sides with these images, the total stitch count is 99,992. There are 14 unique threads used. 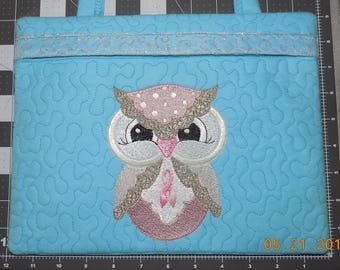 The full purse is stipple quilted to batting, making it sturdy without being overly bulky, and the quilting will prevent shifting of padding even after many years of use. The strap is 38", providing a 19" drop. There are tabs, clips and rings so that the strap can be reconfigured and shortened as desired. ***THIS EXACT PURSE IS ALREADY SOLD*** -- You will be custom ordering a purse of your very own! Your purchase includes the case only -- no devices or other contents are included! -- and will be sent to you via USPS first class mail in a large envelope. This was a gift. It was beautifully done! The customer service was absolutely excellent. I want more of her work for myself. Wow, what beautiful workmanship and so much fun to do business with. Thank you so much!